Celebrate your unique family's passions and pastimes with Mary and Shelly Klein’s charming illustrations. 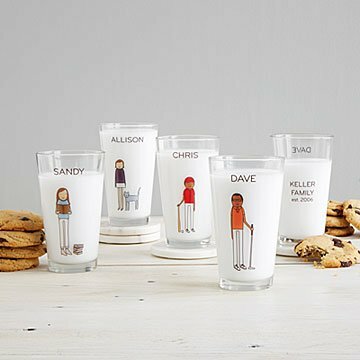 Celebrate your unique family's passions and pastimes with these charming personalized tumblers. Create each familiar "character" by choosing their hobby, skin tone, hair color, clothing, and first name, then add your family name and year established (optional). The set is a cheerful, special way to keep loved ones connected, whether you're all around the same table, or enjoying some refreshment in different time zones. Illustrated by Mary and Shelly Klein in Michigan. Made in the US. Bought eight for my kids, grandkids, and me. Everyone loved them. One son took his home, but the rest were left at my house for family dinners. Other friends and family saw them and loved them. My mother in law actually told me to buy her one. Lol. So I ended up with four more for others that frequently come over. It's a great way for friends and family to be reminded that they are a special part of my life. My kids loved designing these and use them every day. Their only suggestion was that glasses be an add option option to any of the people because they all wear glasses but very few of the kids figures had them. Such a cool gift for children or teens who like sports. I may have failed on filling the Christmas stockings this year, but getting these artistic and unique tumblers for each family member saved the day for me, Santa. All of the tumblers arrived before Christmas as promised. The artisan accidentally switched my "Greg" family member with another family's Greg. They sent me the correct tumbler free of charge. It arrived after Christmas, but that's okay, everyone is happy. I suggest the artisan continue to add more character traits, especially activities that people like to do. For example, add fishing, hunting, skydiving, scuba diving, sailing, and so many more. Also, work on facial choices- moustache without beard, full beard, beard color different from head hair color, etc. Last minute gift a huge hit! I got a set of these glasses for my son-in-law's family and they love them! They are all very active and the activities depicted were perfect. This Christmas I was stumped on what to buy for my best friends (a family) that have everything and can buy anything. To make it more difficult I had a limited budget and there are 6 in the family. While searching for unique gift ideas on Google I came across uncommon goods and found the custom glasses. I created a character for each person in the family, selected the best hobby that represented them and gave a fun name and est. date. When the family opened the box, instant tears of joy. You would've thought I gave them a million dollars. Best money spent in a long time. Since, they added to the collection by creating a glass for all their best friends so everyone has their own glass when they come over. Easy addition to my family's normal set of glasses, now with a unique story to tell.